Freezing is one of the simplest ways to preserve fruit at home. The extreme cold retards microorganism growth and slows changes that cause the fruit to spoil. Citrus fruits, like oranges and tangerines, will maintain their high quality in the freezer for up to six months when properly frozen. They will also retain most of their nutrition and flavor. 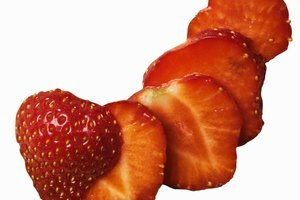 Once thawed, their texture may be softer than that of fresh fruit. 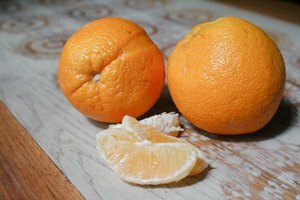 You can freeze oranges or tangerines whole, in pieces or packed in syrup. Rinse the oranges or tangerines under cold, running water. Pat them dry with a towel. Place the whole fruits in glass jars, rigid plastic containers, plastic freezer bags or waxed cartons. Press out excess air if you’re using a bag or plastic container. Mark the current date clearly on the container with a permanent marker. Put the container in the freezer. Wash and dry the oranges or tangerines thoroughly. Peel the rind off the fruit and pull the fruit apart into segments. 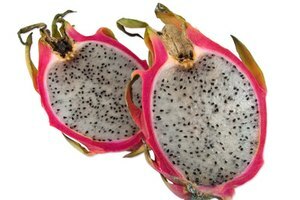 Cut the fruit into smaller pieces with a knife, if you wish. Place the fruit segments or pieces into a freezer container. Leave 1/2 inch of space at the top of the container for the fruit to expand when it freezes. Remove the excess air from the container, if possible. Seal the container tightly. Write the current date on the container with a marker and store the container in the freezer. Pour 3 1/4 cups of sugar into a large bowl and add 5 cups of warm water. Stir until the sugar is completely dissolved. Wash, peel and pull apart the oranges or tangerines. Leave them in segments or cut them into smaller pieces. Place the fruit into a freezable rigid plastic container or glass jar. Pour some of the syrup mixture into the fruit container. Use 1/2 cup syrup for each 1 pint of fruit. Leave 1/2 inch of space at the top of the container. Store any unused syrup in the refrigerator. Seal the container and write the current date on it. Place it in the freezer. Dissolve 1/4 teaspoon of ascorbic acid in a small amount of water and add it to the fruit to further preserve color, freshness and add vitamin C. Use the tangerines or oranges within six months for the best quality. Based in Royal Oak, Mich., Christine Wheatley has been writing professionally since 2009. She contributes to several websites, specializing in articles about fitness, diet and parenting. Wheatley has a Bachelor of Arts in art from Calvin College.